When Facebook launched its Facebook Live video-streaming app last year, I wrote about how important the new tool is for marketers. 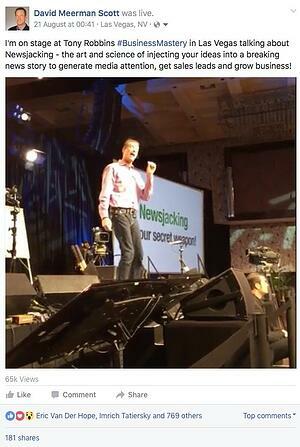 I shared how I streamed a 20-minute segment of my 2-hour talk about new marketing at the Tony Robbins Business Mastery event in Las Vegas. As people were seeing my live broadcast, they began to share on their own timelines and more and more people started to watch. Tony also shared with his nearly 2.5 million Facebook followers and soon there were over 10,000 people tuned into my Facebook Live broadcast. Unlike almost every other form of content creation, Facebook Live immediately online and sharable, promoting you or your business right away. But people can also tune in after the live broadcast. That video stream now has 71,000+ views, 192 shares, and 800+ likes. What a wonderful way to share information with your existing followers and reach people who don’t know you yet! In that post I invited readers to share other uses of Facebook Live and my friend Keith Jennings, Vice President of Marketing at Jackson Healthcare told me how he and his colleague Kelli Straub use the streaming service to connect with Jackson Healthcare employees. What a great example of how to use Facebook Live! I hadn’t thought of it as a tool for internal communications so I asked Keith for details on how he uses it. Headquartered in Atlanta, Georgia, Jackson Healthcare is among the largest healthcare staffing and technology companies in the U.S. Of the more than 900 associates the company employs in Atlanta, more than 50 are not located at the headquarters. Plus, they have more than 300 associates located outside of Georgia. Jackson Healthcare had been using Facebook for some time when the idea of using Facebook Live presented itself. After the video went live, Kelli boosted it using Facebook Ads to ensure wider distribution. It generated 1,300 organic views and 4,000 paid views. While the numbers were strong, it wasn’t until employees mentioned seeing it that the initial broadcast was deemed a success. After several other successful video streams using Facebook Live to reach employees, the team was ready for their big moment. Despite heavy rain, higher noise levels than anticipated, and sketchy cell service, the team pulled it off. 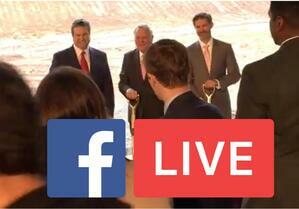 The Facebook Live broadcast had 1,200 viewers who tuned in live for some or part of the event. With those who watched later, there were more than 8,000 total views with 2,700 organic and 5,400 paid. Here are the key takeaways about using Facebook Live for employee communications from Keith Jennings and Kelli Straub at Jackson Healthcare. Be clear about what job you're hiring Facebook Live to do. Our goal has always been to help our associates feel like insiders and not miss out on big events. It's important to announce and personally invite people to your Facebook Live event. And there's a fine line between announcing too early and too late. For us, it seems the ideal time to invite associates to tune in is the afternoon before the day of the event. Very few people will hang through the duration of the live event. They drop in and out. And that's okay, because our goal is to give them a feeling of inside access. The view time ranges from 11 seconds to 2 minutes. There is a cliff-like drop-off in viewership within this timeframe. Most people will view the event after it's over. Those that couldn't attend live will scan through the video. Those who were at the event will go watch pieces of it. Don't underestimate the importance of the right equipment (a gimbal, an external mic & phone with plenty of battery power and available storage) and dependable network connections! Thank you Keith and Kelli for sharing with us! Readers would love to know of other creative uses for Facebook Live. Please share in the comments!